Note: The giveaway has ended. Winner has already been announced. My anniversary celebration extends til Oktoberfest! I'll be giving away Php 1500 worth of GCs from Brotzeit. I have to Brotzeit numerous times and I have always enjoyed their authentic Bavarian offerings, and of course, the Paulaner beers. 1780 by SariSari: The Hidden Gems of the Philippines in 1 Website! I was invited last October 15, 2014 to witness the launch of the the sub-portal dedicated for the products from the different parts of the archipelago to reach out on a wider market: 1780 by SariSari. These products are carefully sourced from 17 regions, 80 provinces, Sarisari highlights the best that the Philippines has to offer in terms of gastronomy and craftsmanship. 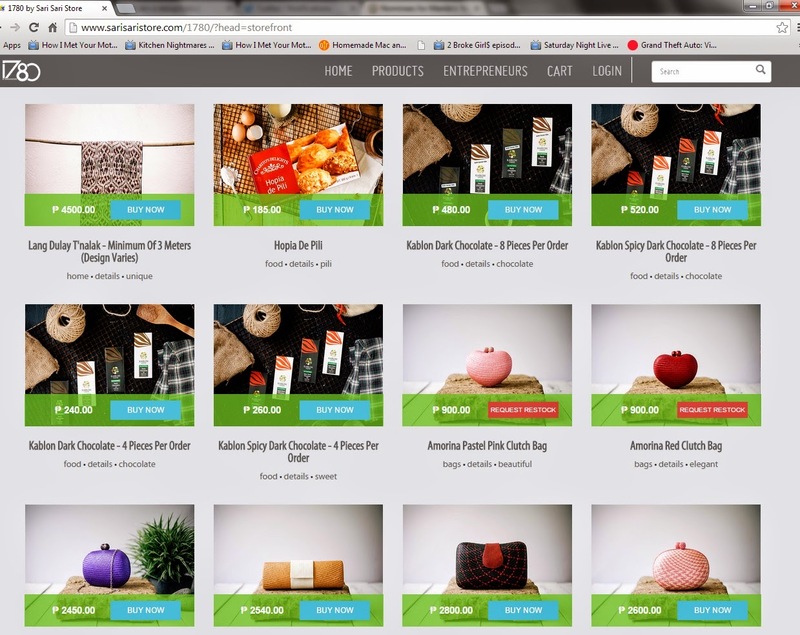 1780 by SariSari puts a modern flair to a variety of Filipino products. Patti Grandidge, owner of handcrafted cupcake store Sweet Patti Cakes, has created a limited edition cupcakes using the organically-grown Dark Chocolate from Kablon Farms. Amina Aranas, a local designer and fashion influencer, collaborated with one of 1780 by SariSari's merchants to craft a bag using native materials which will be sold exclusively on the site. 1780 by SariSari was also joined by Ivan Henares, a traveler and tourism influencer, who discussed his advocacy towards heritage products and sites around the country. As a health food convert, I'm always on the lookout for healthier alternatives of the food I indulge myself with. I was glad to find out about TheBasics. Just a few weeks old, TheBasics intends to make food products from natural ingredients, with no preservatives. First in their product line is the Original Muscovado Peanut Butter. I've been working in Ortigas for years, and though I have been here for quite a long time, I still haven't been to a lot of hang-out places around this area. I was glad to chill out last weekend in one of the newest bar and resto in this business district called Descanzo Bar & Resto. Descanzo, which means "to relax" in Spanish, is located at the heart of Ortigas. Opened last February 2014, the place is open for breakfast to late dinners and drinks. Do you have a great-tasting dish or do you have an innovative food concept that you think would sell well in a weekend food market? 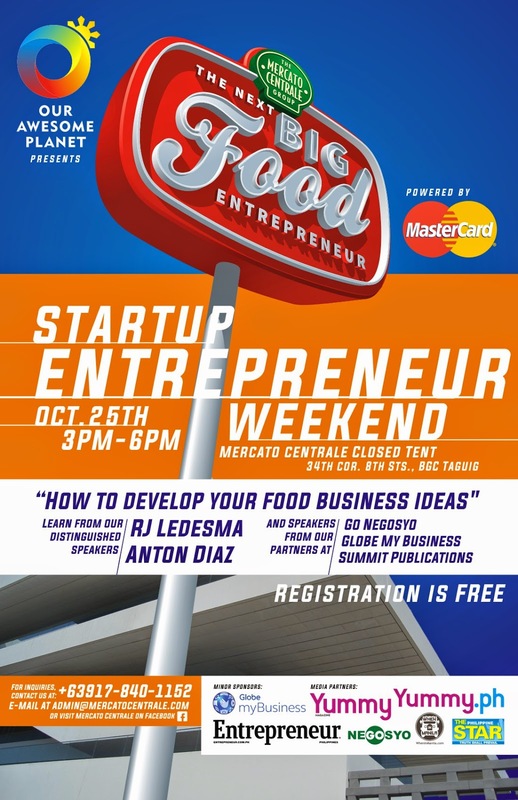 Then we invite you to join us for a FREE SEMINAR on HOW TO DEVELOP YOUR BUSINESS FOOD IDEAS during our STARTUP FOOD ENTREPRENEUR WEEKEND on October 25 (Saturday) from 3:00pm to 6:00pm at Mercato Centrale, at the corner of 34th Street and 8th Avenue in Bonifacio Global City. The half-day seminar will include topics on how to start up and run a food business, identifying food businesses with franchise growth potential, current food market business trends, digital and social media marketing for small food businesses, and the stories of successful food market entrepreneurs. 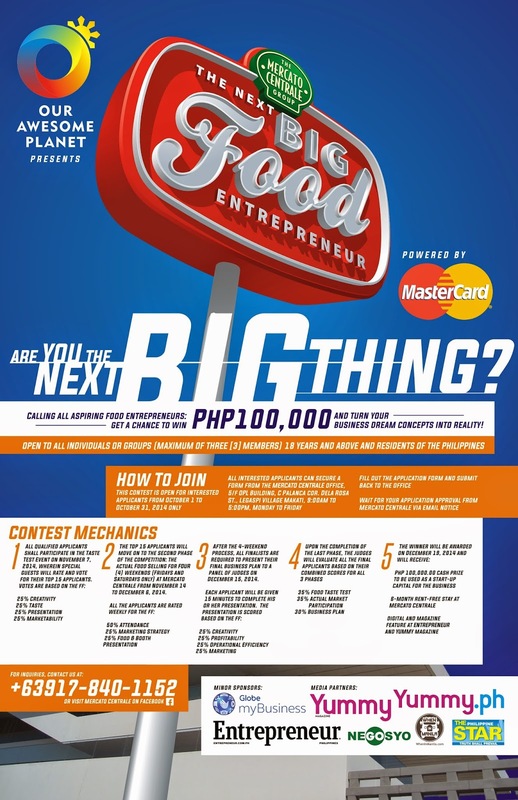 Among the speakers for seminars include Armando Bartolome of GMB, Franchise Developers (whose previous clients are Mang Inasal, Potato Corner and Lots’A Pizza), Anton Diaz and RJ Ledesma of Mercato Centrale, resource speakers from Go Negosyo and Globe MyBusiness and successful Mercato food entrepreneurs Jill Gerodias Borja of Manang’s Chicken and Suzy Lee of Spring by Ha-Yuan. We devoted a full day to explore the temples and famous landmarks of Bangkok. We figured out that the Grand Palace alone will consume much of time so it was our first priority for the day. From our guesthouse, we rode the BTS to Saphan Taksin (S6), Silom Line. Saphan Taksin station is connected to the Sathon pier where we rode the Chao Phraya Express Boat. A one-way ticket for the tourist boat is 40 Baht (Php 54) per person. We got off Ta Chang Pier (N9), which is a few meters away from the entrance gate of the Grand Palace Complex. Note that there is a dress code you should adhere to when entering the Grand Palace Complex. Shorts, short skirts, sleeveless tops, cropped tops, flipflops are not allowed. However, you can borrow clothes for 200 Baht (Php 272) deposit per item. We began our morning at the Marina Resort playing in the Hanging Bridge. Then we went back to the clubhouse for our breakfast. Extremely ecstatic, that was my feeling when I was invited to have a weekend getaway with my college friends at Caliraya Mountain Lake Resort. From the Clubhouse, we couldn't help walking towards the golf course. The vast field was indeed breathtaking.